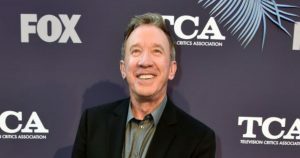 The “Last Man Standing” star spoke with Entertainment Weekly in an interview released Thursday about the return of the popular program later this month following its cancellation last year by ABC. Allen plays Mike Baxter, who was known for freely expressing his conservative political views on the show. Art imitates life in that regard, as the actor tends to lean to the right politically, and was one of the relative few from Hollywood who attended Trump’s inauguration in January 2017. Entertainment Weekly asked Allen how he feels about the president.